We supply a range of communication hubs and sensors tailored to the needs of farmers and individual crops. Our equipment records conditions above and below ground 24 hours a day. These are transmitted automatically to our cloud-based data warehouse, where the data can be accessed via a web-based portal. We provide a flexible architecture which we tailor to the needs of each individual crop. 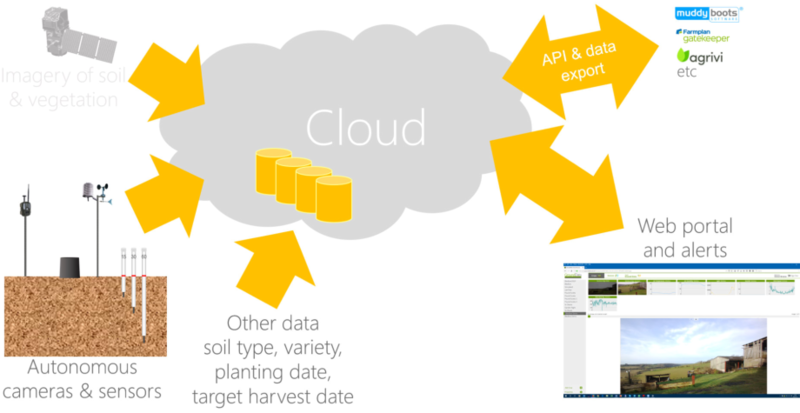 Thus growers can get the information they need based on the crops being grown and the layout of their farm. We carefully manage data rights so that advisors and partners such agronomists can access data directly. Our initial focus is on helping potato growers, though our technology is also appropriate for other root and irrigated crops. We collect data for emergence prediction, feeding growth models and helping support accurate irrigation – our sensors tell you how damp it is underground, so you know whether to irrigate or not. We measure moisture at varying depths, so you have the right data as your crop develops. Earlier in the season monitoring shallower depths to help avoid potato scab, and as root systems develop, deeper probes tell you what is happening as tubers bulk up. 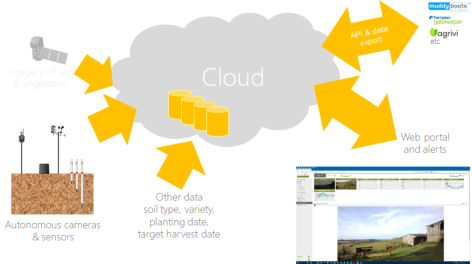 We provide accurate up to date environmental data, for farmers and agronomists recording exactly what is happening in their fields at 15 minute intervals. Our colour cameras takes photos every day, so users can see how the crop looks and provides you with an accurate view of emergence, leaf canopy coverage and senescence. These pictures and all the other data are safely archived for further analysis once the quality of a crop and yield is known. All the data we collect is stored safely in ‘the cloud’ free from human error. We collect data from our range of sensors at 15 minute intervals, and take a photo around midday. • Rain and irrigation measurement • Air temperature & humidity • Soil temperature & moisture • Ambient light/radiation input • Camera for remote observation and leaf canopy measurement Apart from increased precision, our system prevents wasted journeys e.g. should the crop not have emerged sufficiently for an inspection. You also have the option of looking back through the growing season to double check your analysis. We take great care to make sure our equipment is reliable, that you have both access to the data collected and put in measures to ensure you know where it was collected and by which piece of equipment. • Location/GPS: even if you muddle two cameras they all report their actual installed position. • Unique serial number: inevitably sensors will fail from time to time, so each of ours has a unique serial number so data can be reversed out should it be found to be unreliable. • Should cellular coverage fail or the signal become too low because of atmospheric conditions, cameras store all the data on an SD card to ensure continuity of data.